We Spay and Neuter Cats As Young As 8 weeks old. If the cat is under 3 months of age, It will NOT be vaccinated for Rabies - You have to come back and pay $15 for Rabies. Keep in mind most cats go into heat and can get pregnant at 5 months of age. 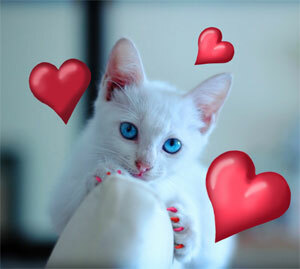 Soft Paws- Soft Paws are small rubber nail coverings that are applied to the claws.They normally stay on for one to three months (Depending on the cat & activity)Ask for color availability. 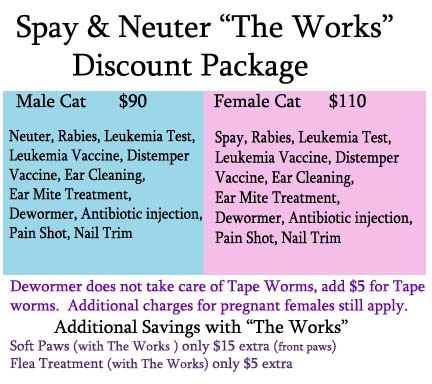 If a cat is brought for a spay or neuter surgery and cat has already been spayed or neutered $30 will be charged. To receive a free rabies vaccine, they must be 3 months of age or older. Kittens under 3 months of age, will NOT receive a rabies vaccine. For reasons not to declaw... check out this link.